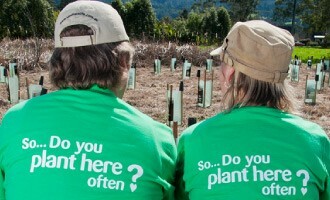 What can you do for Landcare? What Landcare can do for you? Landcare is a joint effort between the community, government and business to protect and repair our environment. 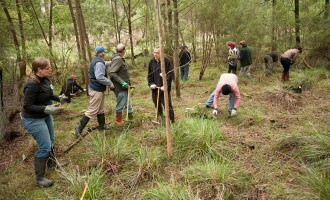 "Landcare is a local volunteer movement that has grown since it began in Victoria in 1986. It involves thousands of Victorians and more than 700 groups workingA together to shape the future of our land, biodiversity and waterways. The Landcare movement began in 1986 in Victoria when Joan Kirner, then Minister for Conservation, Forests and Lands, and Heather Mitchell, then president of the Victorian Farmers Federation joined forces to create what was then called Land Care. A group of farmers near St Arnaud, in central Victoria formed the first Landcare group. For these farmers, it made sense to work together to tackle their shared environmental problems. The movement has grown from this to the adoption of a broader focus on sustainable management of all of Victoria’s natural resource assets. It now encompasses individuals and groups across the whole landscape from coastal to urban and remote areas of Victoria. The Landcare movement became National in 1989, when Rick Farley of the National Farmers Federation and Phillip Toyne of the Australian Conservation Foundation, worked with the Hawke Labor Government to create the National Landcare Program. Being a part of Landcare is a way to help our environment, wildlife, farmers and community. Landcare volunteers range from retirees to families, surfers to farmers and corporates to students. United by a shared desire to create positive change in their local community and environment, these individuals recognise that collectively their efforts have greater impact. The success of the Landcare model is due in part to its grass roots philosophy. A Landcare group usually starts when community members with common objectives come together to tackle a local environmental issue, for example, weeds affecting agricultural productivity or the protection of an area of remnant native vegetation. Groups work together to develop their own priorities and projects and are often supported through this process by a Landcare network and their regional Catchment Management Authority. Groups apply for funding from a variety of different sources including local, state, and federal government, and corporate and philanthropic organisations to support their work. Generally, committees oversee a group’s operations, apply for project funding and organise activities like community workshops or tree planting. Increasingly, Landcare groups are also collaborating to form Landcare networks that take a more regional approach to environmental issues and coordinate activities to achieve catchment wide outcomes. These Landcare networks also provide a community link to all levels of government and industry for financial support and information. The success of the Landcare bottom up approach can be attributed to the inspiring contributions made by the passionate individuals who make up Victoria's and Australia's Landcare movement. Their sense of stewardship, enduring commitment and deep appreciation for our natural environment is why Landcare exists today. Landcare’s people are its greatest asset."